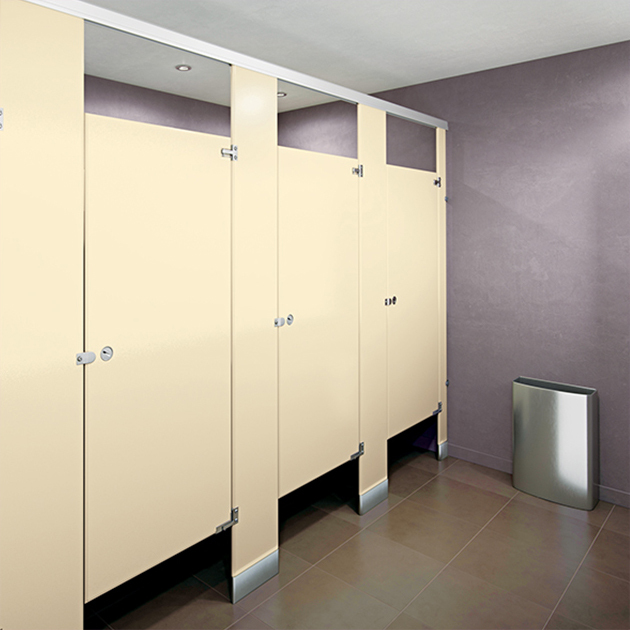 Toilet Partition Material Selection — Specialties Direct Inc.
All finishes are type #304 Stainless Steel. 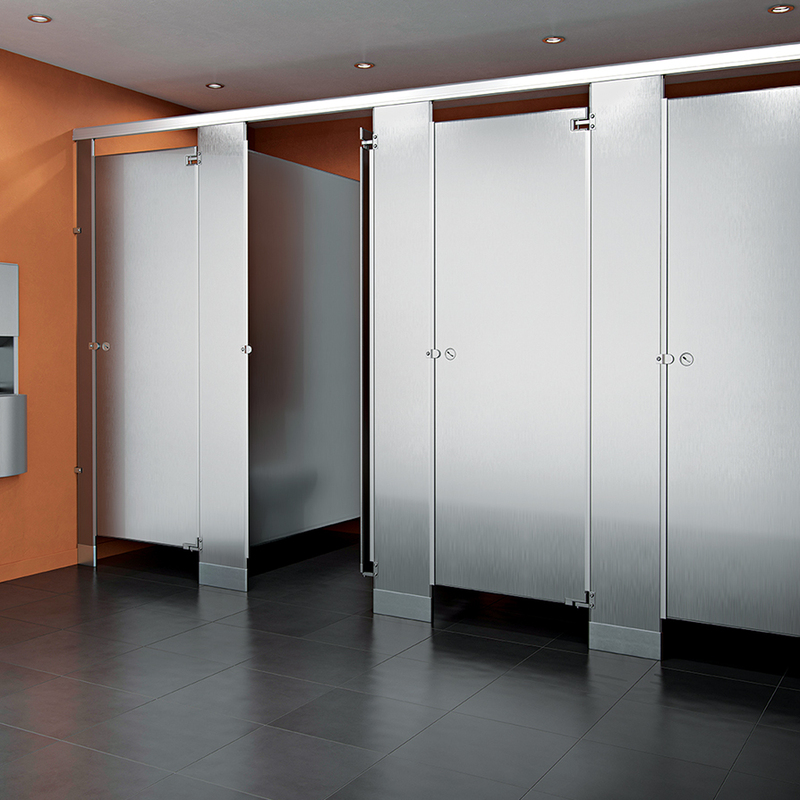 Stainless steel toilet partitions provide a modern look and retain their beauty indefinitely. By adding a textured finish, increased resistance to vandalism can be achieved. Available in all four mounting styles. 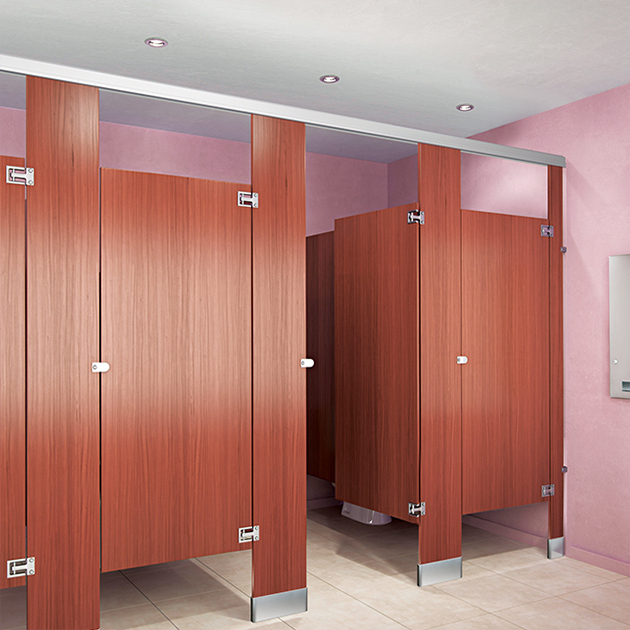 Solid Plastic partitions are water resistant and unaffected by steam or high humidity. Our solid plastic partitions have passed the NFPA 286 fire test standard. Our most popular colors are also available in 100% post-consumer recycled material. Ideal choice for busy public facilities and high humidity applications - never needs painting and will not easily dent, rust or delaminate. Available in a wide variety of colors. 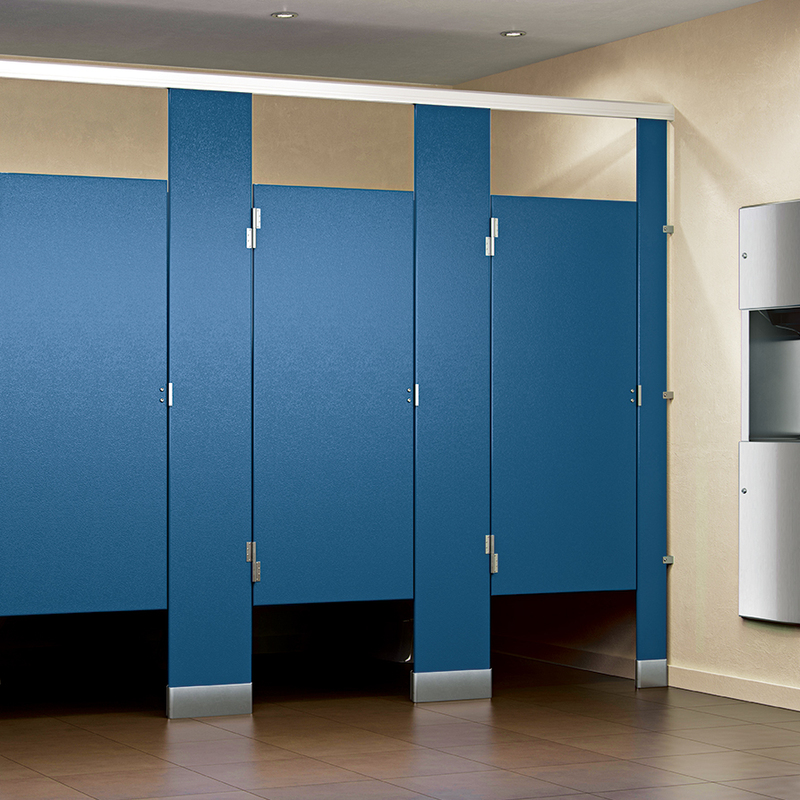 The powder coating and galvanized steel on these partitions provide quality and economy. The finish is resistant to wear, fading and scuffing. It is easily cleaned and wiped dry. High-tech quality at an economical price.Thermoset hybrid powder finish on galvannealed steel is highly resistant to corrosion, grease, acids, caustics, mars and stains. A broad range of contemporary colors to complement any interior. 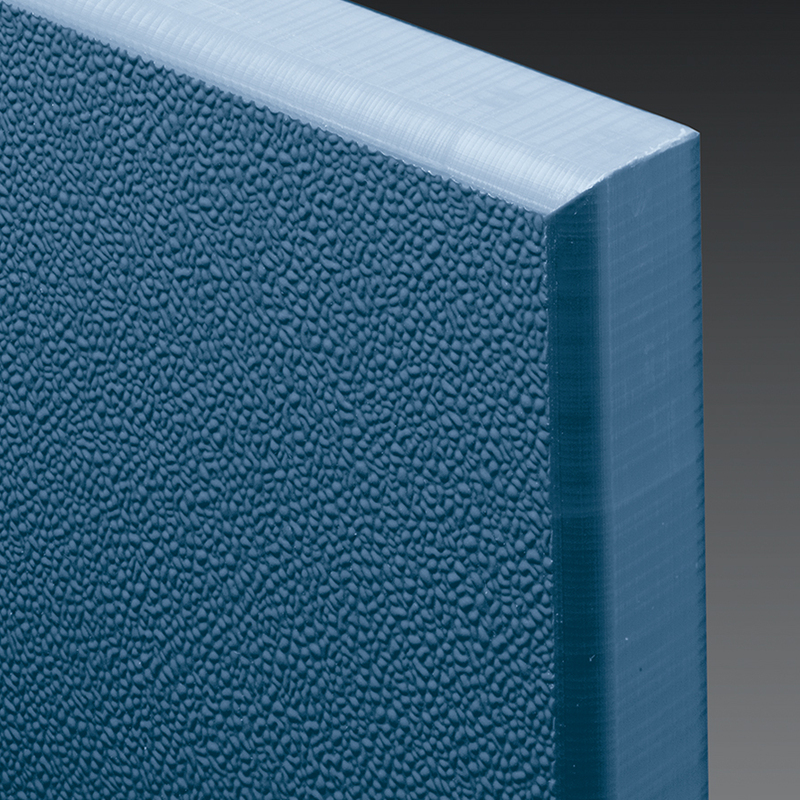 Introducing the new Plastic Laminate Partitions with Moisture Guard™ Edge Banding. Our Moisture Guard™ Edge Banding fuses with the substrate creating a seamless beveled profile that eliminates any unsightly black lines that appear in standard Plastic Laminate. ASTM tests on Moisture Guard™Edge Banding confirms 3X greater durability with increased resistance to moisture and humidity than standard Plastic Laminate. Available in 45 colors/patterns and our new Easy Stall Shoe* speeds up the installation process. Our Plastic Laminate with Moisture Guard™ Edge Banding is now backed with an industry leading exclusive five-year warranty. Black Core Phenolic partitions sheets are fused at high temperature and pressure. In addition to strength and serviceability, a wide range of colors provides limitless design flexibility. Holds up even under severe moisture conditions from showers, pools and saunas, or when maintenance includes hosing down toilet partitions. Ideal for where vandalism is a problem. Class “A” Fire Rated Material­—Black Core Only.